Publisher Aspen Comics, in partnership with The Powell Group, launched a series of custom PlayStation themes based on three of their popular series: Fathom, Soulfire, and Executive Assistant: Iris. Both the Fathom and Soulfire theme sets feature art exclusively by Aspen Comics founder Michael Turner with colors by Peter Steigerwald. The Executive Assistant: Iris theme set contains the work of pencilers Joe Benitez, Micah Gunnell, and Eduardo Francisco, with colors also by Steigerwald. Each theme package features three unique skins to customize your PlayStation background. These themes are available for purchase at the PlayStation Store. Together, Aspen and The Powell Group are working to develop additional waves of skins utilizing other Aspen properties to be released at a later date. Throughout history, oddities have remained hidden away within the fabric of societies across the planet. However, in recent years these unexplained phenomena have begun to emerge with a vengeance…Enter Gia Sorentino. They thought she was crazy, and locked her away from the rest of the world. Yet, following a family tragedy, she has inherited an empire—-and with it, the keys to unlocking some of the most unimaginable secrets of mankind. Together, with three other women who possess abilities of inhuman nature, Sorentino embarks on a journey to discover the full potential of their collective powers. But, along with the amazing comes the sinister, and some things that should have remained hidden–including those that can threaten not only their existence, but the rest of the world as well! FOUR POINTS #1 is in stores April 8th, 2015! 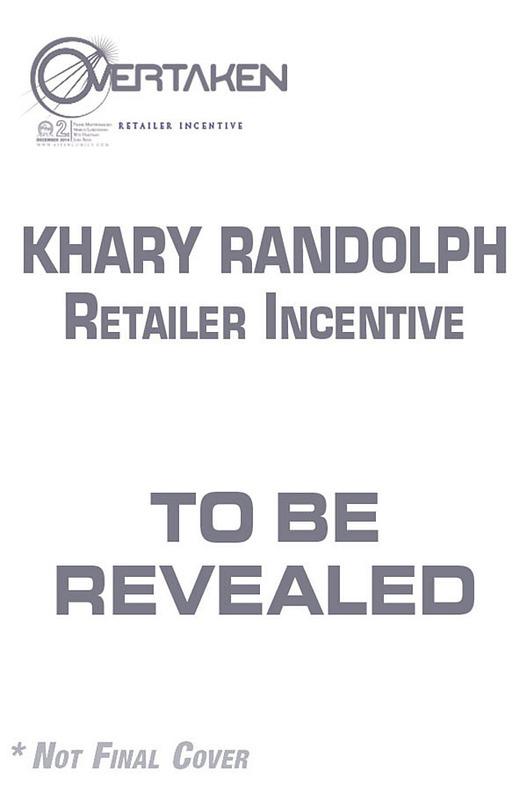 RETAILER NOTE: FOUR POINTS #1 will ship with two different covers by series artist Jordan Gunderson and artist Khary Randolph. Each cover is available to order separately, with no quantity limitation or restrictions. For every 10 copies of FOUR POINTS #1 ordered, retailers will receive one (1) FREE copy of the alternate FOUR POINTS #1 cover by series artist Jordan Gunderson, with the option to purchase up to three (3) additional Gunderson alternate FOUR POINTS #1 covers at net $4 each. For every 20 copies of FOUR POINTS #1 ordered, retailers will receive one (1) FREE copy of the Jordan Gunderson FOUR POINTS #1 Sketch Cover, with the option to purchase up to three (3) additional Gunderson FOUR POINTS #1 Sketch Covers at net $6 each. A new heroine rises from the legends of the ancient world! Shahrazad was known for her amazing tales of 1001 Arabian Nights, but now it is time to tell her story! She lives a life unlike anything you could possibly imagine–an existence that spans generations as well as genres! SHAHRAZAD #1 is in stores April 1st, 2015! RETAILER NOTE: SHAHRAZAD #1 will ship with two different covers by series artist Mike Krome and artist Siya Oum. Each cover is available to order separately, with no quantity limitation or restrictions. For every 8 copies of SHAHRAZAD #1 ordered, retailers will receive one (1) FREE copy of the re-mastered SHAHRAZAD #1 cover by artist J. Scott Campbell and colorist Peter Steigerwald, with the option to purchase up to three (3) additional re-mastered Campbell/Steigerwald SHAHRAZAD #1 covers at net $4 each. LOLA XOXO: WASTELAND MADAM #2 is in stores April 29th, 2015! 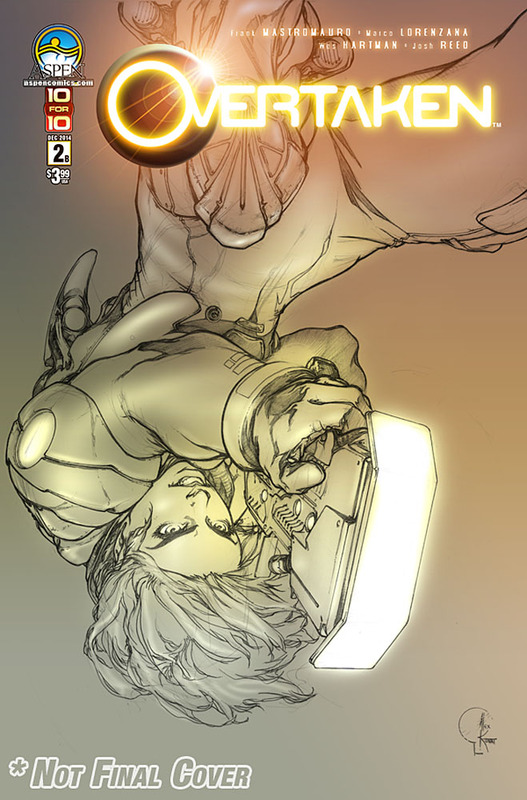 RETAILER NOTE: LOLA XOXO: WASTELAND MADAM #2 will ship with two different covers by series artist and creator Siya Oum and artist Lori Hanson. Each cover is available to order separately, with no quantity limitation or restrictions. For every 10 copies of LOLA XOXO: WASTELAND MADAM #2 ordered, retailers will receive one (1) FREE copy of the alternate Dawn McTeigue LOLA XOXO: WASTELAND MADAM #2 cover, with the option to purchase up to three (3) additional McTeigue LOLA XOXO: WASTELAND MADAM #2 Covers at net $4 each. 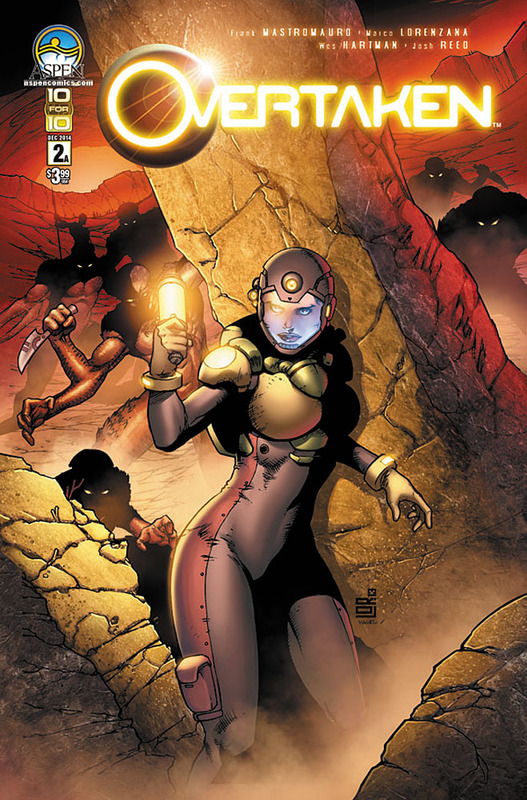 FATHOM: KIANI vol 4 #3 is in stores April 22nd, 2015! RETAILER NOTE: FATHOM: KIANI vol 4 #3 will ship with two different covers by series artist Giuseppe Cafaro and artist Alex Konat. Each cover is available to order separately, with no quantity limitation or restrictions. For every 10 copies of FATHOM: KIANI vol 4 #3 ordered, retailers will receive one (1) FREE copy of the alternate FATHOM: KIANI vol 4 #3 cover by artist Agnes Garbowska, with the option to purchase up to three (3) additional Agnes Garbowska alternate FATHOM: KIANI vol 4 #3 covers at net $4 each. After their encounter with the villainous Qaurec, Abros is in a race to save his son Ty from death. Can he and Minalara keep Ty alive or will Abros lose the only family he has left? The critically acclaimed series continues! THE ZOOHUNTERS #4 is in stores April 29th, 2015! RETAILER NOTE: THE ZOOHUNTERS #4 will ship with four different covers by series artist Peter Steigerwald, Billy Tan, Joe Benitez and David Finch. Each cover is available to order separately, with no quantity limitation or restrictions. For every 12 copies of THE ZOOHUNTERS #4 ordered, retailers will receive one (1) FREE copy of the alternate THE ZOOHUNTERS #4 cover by artist Peter Steigerwald, with the option to purchase up to three (3) additional Peter Steigerwald alternate THE ZOOHUNTERS #4 Covers at net $4 each. Aspen’s first Executive Assistant Annual ever is jam packed with three brand new stories featuring the most popular Executive Assistants! The EA that started it all, Iris, returns for a thrilling new adventure that explores her new life beyond the conflict of her past! Also, explore fan favorite EA Rose’s tumultuous history with her overbearing master, plus a brutal prison tale featuring the popular EA Orchid! Don’t miss out on the debut of the first ever EXECUTIVE ASSISTANT IRIS ANNUAL #1 in this thrilling oversized issue featuring a re-mastered EA IRIS cover by original series designer Joe Benitez and colorist Peter Steigerwald! EXECUTIVE ASSISTANT IRIS ANNUAL #1 is in stores April 15th, 2015! Aspen Comics has announced the launch of over 350 new and classic titles from the publisher’s digital library available starting on October 23 on Madefire. Madefire delivers Motion Books, an interactive audio-visual reading format that combines art and sound for a new style of digital storytelling. The new titles will be available on both the Madefire iOS and Android apps for tablets and smartphones. Madefire Motion Books & Comics has been a 5-star rated app since launch and recently recognized in the iOS App Store as an Editors’ Pick, Best New Apps and Best of July (2014). The Madefire Motion Book Tool was also recently launched to the public in July and has been continuously developed with the creator in mind. Taking static art a step further by incorporating movement, sound and depth to visual reading, the platform continues to push the limits in digital storytelling. New features have been introduced to allow for a more streamlined creative process like creating covers with a click of a button and animating art in a few simple steps. Publishing to the web has never been easier and can take as little as 5 minutes. The ease of sharing your story on a website or blog is also more fluid now with an embed code automatically created when the book is published, giving the creator control of where and how their story is told. 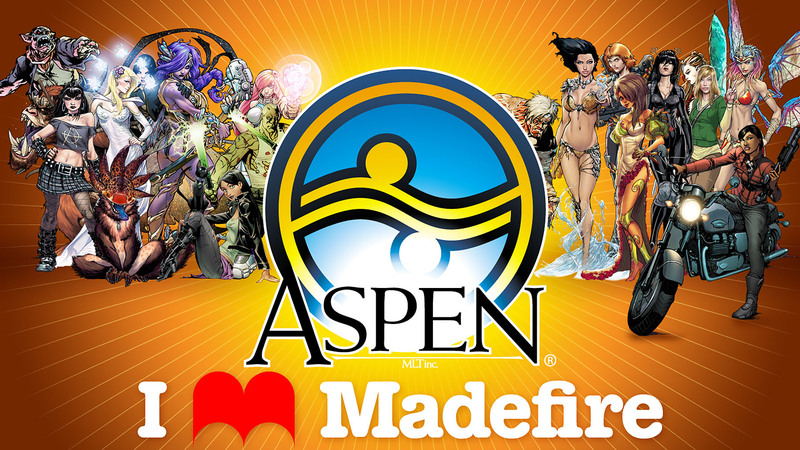 The first wave of Aspen Comics’ books on Madefire will cover a large variety of titles including Michael Turner’s Fathom and Soulfire, Executive Assistant: Iris, Lola XOXO in addition to a majority of the publisher’s past library of books. New releases such as Aspen’s upcoming The ZooHunters will also be available day and date on November 5. Aspen Comics plans to include titles from their all-new Big Dog Ink imprint soon as well. OVERTAKEN #2 is in stores December 17th, 2014! RETAILER NOTE: OVERTAKEN #2 will ship with a standard direct cover and an Aspen RESERVED Variant Edition cover by Fathom artist Alex Konat and colorist Peter Steigerwald that is available to those who reserve copies through their retail store. Each cover is available to order separately, with no quantity limitations or restrictions. For every 12 total combined copies of the standard and Konat Reserved variant edition covers ordered, retailers will receive 1 (one) FREE J. Scott Campbell sketch edition cover with the option to purchase up to (3) additional J. Scott Campbell sketch edition Covers at net $8 each. Michael Turner’s best-selling Fathom series has celebrated over 15 years of thrilling adventures, and now fans and new readers alike can dive even deeper into the depths of the Fathom Universe with Aspen’s first-ever FATHOM: SOURCEBOOK! Jam-packed from cover to cover with detailed character profiles, in-depth power charts, revealing story elements and so much more–this is the definitive source to learn about all things Fathom! 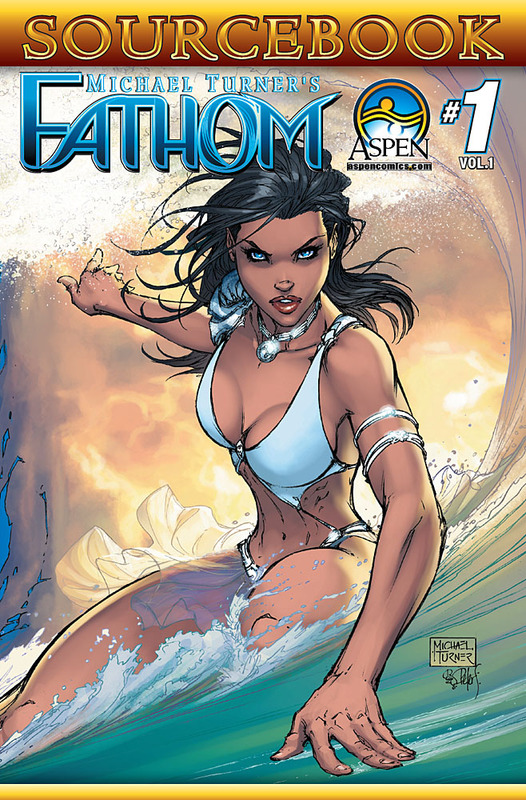 FATHOM: SOURCEBOOK #1 is in stores December 10th, 2014!